The Bunker LaserTag arena is located within the grounds of UCZ, Exeter (Poltimore), which includes a World War II RAF bunker and a Cold War Nuclear Bunker. The nuclear bunker is dedicated to Bunker LaserTag. Avoid being shot by the Zombies, or you too will be infected with the deadly virus and slowly become a Zombie yourself. The more you get shot by a Zombie, the quicker you will turn in to the Walking dead! 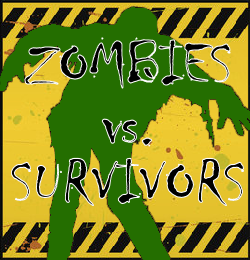 Our new, exciting, Zombie Mode adds a new, and tense style of game-play to our scenario list, providing a nail-biting game of survival against slowly mounting odds. Enjoy this new game at our Saturday morning Under 18s Zombie Club or as part of your exclusive party or group package booking! Off Junction 29 from the M5: follow the signs to Exeter Business Park and Pinhoe. Drive through Pinhoe and stay on the Pinhoe Road, heading towards Politimore and Broadclyst. Just after a speed camera and before the bridge over the M5, take a left turn marked by a brown tourist sign marked UCZ PAINTBALL PARKS. The venue will be clearly visible on your left about 1/4mile along this road.